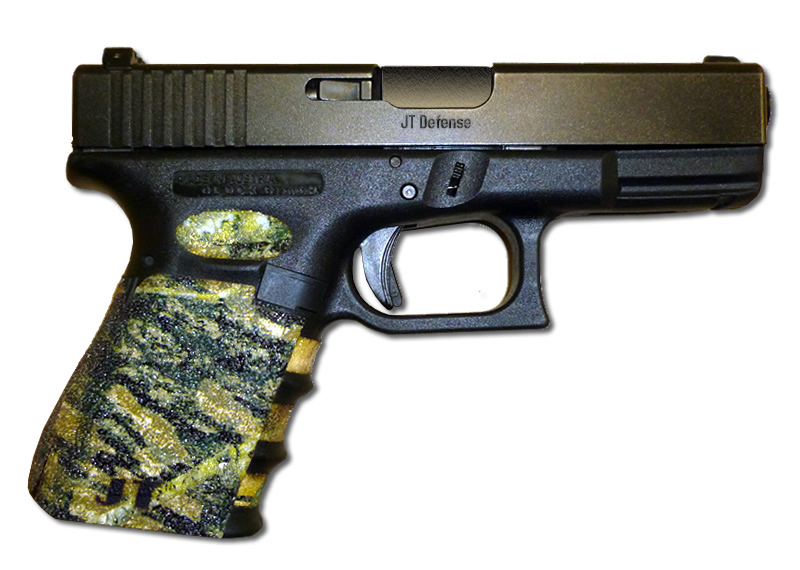 The JT Defense Glock 23 grips, identical to our Glock 19 decal grips in form and function, wrap around the frame of the gun, and secure with an adhesive, that not only adheres to the polymer, but applying a small amount of heat, wraps completely around the grip, customizing your Glock for form and function. 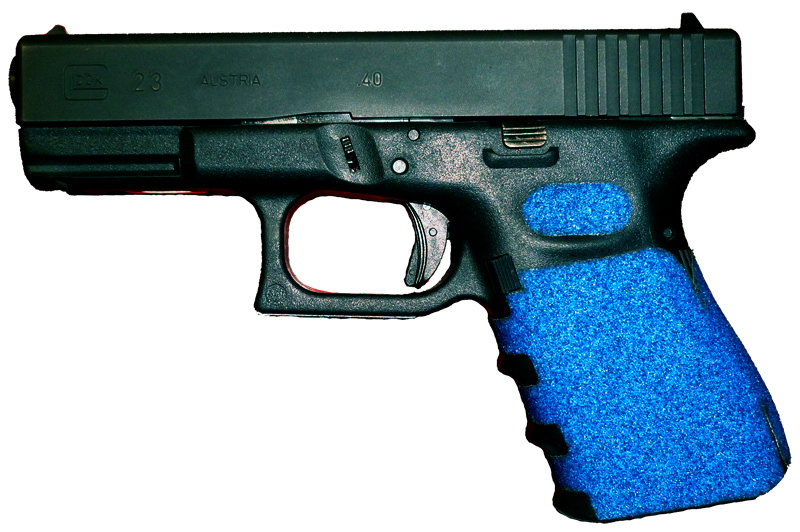 Custom designed, 3d modeled and computer designed, then laser cut, the Glock 23 decal grips provide not only a firm grip on your Glock, but the grips actually aid in your ability to physically focus on the target and your trigger pull, and not how you're holding the gun. The slightly increased recoil of the Glock 23, 40 caliber, requires you to firmly hold the gun tighter, causing your focus to be diverted to how you're gripping the gun, not concentrating on the target or your trigger pull. During tests with the Glock 23 and other models, we found that shooters who have never tried our grips before, shot a much better group, consistently hit targets better, at increased ranges, and the general concensus was, that they didn't want to shoot without the grips installed on any of their guns, ever again. 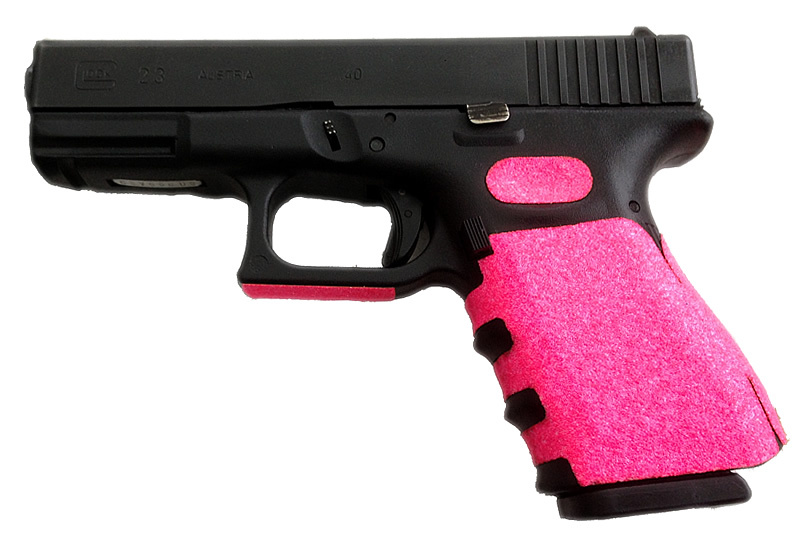 Anyone who tries a set of JT Defense grips for their Glock, instantly wants a set. Because of the simple fact that we do these in volume and they are done on a laser CNC, we have the ability of custom designing your logo, brand, gun club or company directly into the grips. Volume quantities apply. We cannot design and cut single quantity.. minimum order qtys apply. Anything you want cut into your grips, we can do. There will be a minimum 2 week lead time on custom grip orders depending on quantity and complexity of the logo and brand.